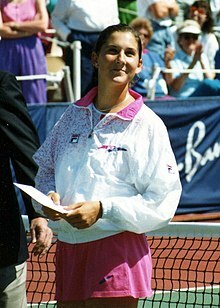 Monica Seles (Hungarian: Szeles Mónika, Serbian: Моника Селеш, Monika Seleš, pronounced [/sɛlɛʃ/], born December 2, 1973) is a retired World No. 1 professional tennis player. She was born in Novi Sad, Serbia (then Yugoslavia) to ethnic Hungarian parents. She became a naturalized United States citizen in 1994. According to published reports in Canadian and Hungarian news media (including two newspapers of record), she also received Hungarian citizenship in June 2007. She won nine Grand Slam singles titles, winning eight of them while a citizen of Yugoslavia and one while a citizen of the United States. She became the youngest-ever champion at the 1990 French Open at the age of 16. She was the dominant player in the women's game during 1991 and 1992, but in 1993, she was forced out of the sport for two years following an on-court attack in which a spectator stabbed her in the back with a knife. She enjoyed some success after returning to the tour in 1995, including a singles title at the Australian Open in 1996, but was unable to consistently reproduce her very best form. Seles played her last professional match at the 2003 French Open, but her official retirement announcement was not issued until February 2008. She was a contestant on Dancing with the Stars in 2008. ↑ Escritt, Thomas (2005-09-01). "The e-circulation wars". The Budapest Sun. ↑ "Titokban lett magyar állampolgár Szeles Mónika (Szeles Mónika has become a Hungarian citizen in secret)" (in Hungarian). Heti Világgazdaság. 2007-06-07. Retrieved 2008-05-09. ↑ "Szeles Mónika megkapta a magyar állampolgárságot (Szeles Mónika has received Hungarian citizenship)" (in Hungarian). Népszabadság. 2007-06-07. Retrieved 2008-05-10. ↑ "Szeles Mónika hazatalált (Szeles Mónika has found her way home)" (in Hungarian). Magyar Nemzet. 2007-06-08. Retrieved 2008-05-10. ↑ "Szeles Mónika titokban felvette a magyar állampolgárságot (Szeles Mónika has received Hungarian citizenship in secret)" (in Hungarian). Nemzeti Sport. 2007-06-08. Retrieved 2008-05-10. This page was last changed on 17 April 2019, at 18:13.